I can't believe I'm writing my last Foodie Friday post for 2013!!! I still have a few more food posts lined up for you, so I'll try to share them here before we end the year. Since I still can't beat my number one blog post - the No-bake Blueberry Cheesecake, which I shared after Christmas of 2010, I've decided to keep it more simple this time. 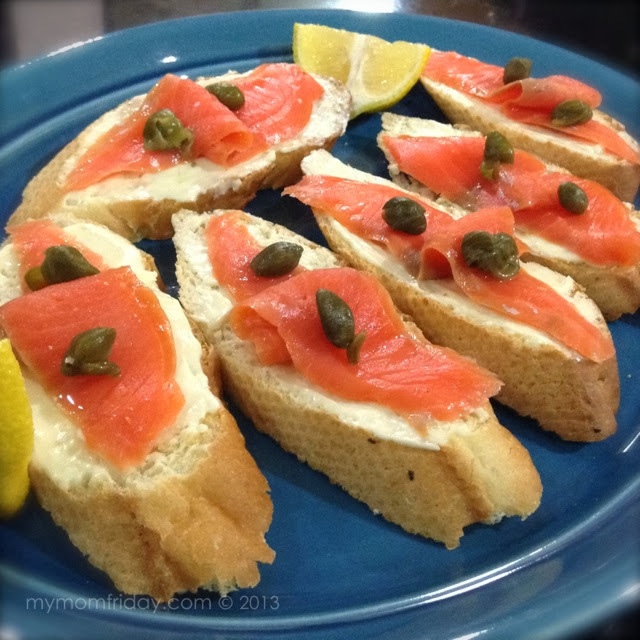 Using cream cheese and smoked salmon, I think this simple hors d'oeuvre is festive enough and still a wonderful dish to serve at your holiday parties and other special occasions. 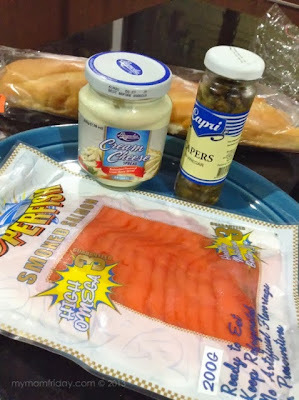 About 2 months ago, I bought a pack of this smoked salmon from the neighborhood grocery because the girl was curious how salmon tastes like. We don't normally eat dishes with salmon so I never buy fresh salmon or frozen fillets, except on a occasions when I feel like cooking something "fancy", like this creamy salmon caviar pasta. I did not complete the ingredients for her tasting dish, so this pack of smoked salmon stayed in the freezer until 4 weeks ago, when I bought a baguette. I told the girl she can finally try this "colored fish" she was curious about with her favorite toasted baguette with cream cheese. It was one of those nights when I was too lazy to cook an additional ulam, and decided I'd just eat this appetizer as my dinner. J did too (since he's on a "diet")! 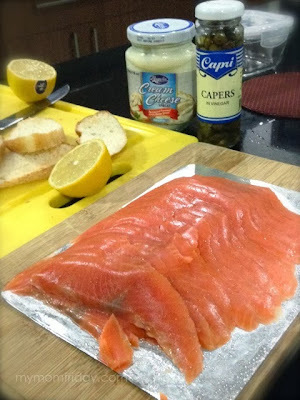 Toast your bread, spread cream cheese, lay down a slice of salmon, and top with capers. Arrange and serve on a platter with lemon wedges. Squeeze some lemon juice over the salmon and devour! 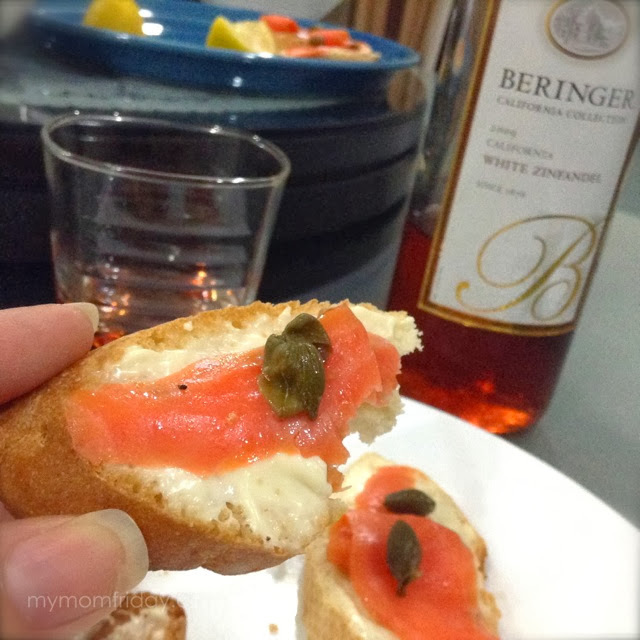 I paired my hors d'oeuvre (this was my dinner so I ate 6) with my favorite Beringer White Zinfandel. Perfection! Hope you try this easy-peasy fancy appetizer... not just during the holidays. Instead of capers, why not garnish with caviar instead? My first salmon dish - Creamy Salmon and Caviar Pasta.